High-rise towers and South Lake Union-scale density is coming to the U-District. The full City Council votes on the U-District plan Tuesday February 21 at 2:00 PM in Council Chambers at Seattle City Hall. Show up and be counted! Require Mandatory Housing Affordability (MHA) requirements of 10% or $22.25/SF for new high-rise towers. Most cities require affordable housing fractions between 20% and 30%. Remove upzoning between NE 50th Street and NE 52nd Street that would demolish many apartments and displace at least 175 units of affordable housing. Cancel the zoning changes if MHA is ruled illegal. Ask for stronger legal protections than a “request to the court”. Conduct a residential displacement risk analysis. Require an implementation plan for business district support. Assess the feasibility of a childcare voucher fund and school impact fees. Finish the MHA Environmental Impact Statement (EIS) before changing zoning rules. Complete the displacement analysis of existing affordable units before rezoning. Direct the Seattle City Attorney to provide an opinion regarding the legality of MHA. Conduct an analysis of impacts on adjacent neighborhoods. Contact your City Councilmembers NOW! Councilmembers Harrell and Juarez have not yet voted on these issues. Join your neighbors at the City Council meeting Tuesday February 21 at 2:00 PM. Bring your signs, green scarves, neighbors, and friends. Come a half-hour early to sign-up and testify. A big crowd will show the City that Seattle neighborhoods care! 4 to Explore: A Northeast Neighborhoods Newsletter – “Let City Council Hear Your Voice“. The Seattle Times – “Allowing more office towers won’t make U District vibrant, livable community” and “Don’t let the U District become the next South Lake Union“. 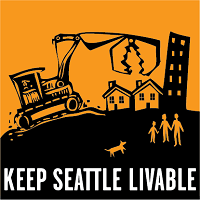 The Seattle Displacement Coalition – Outside City Hall blog. Wallingford Community Council – Mandatory Housing Affordability (MHA). Seattle Weekly – “How Amazon and Vulcan Bought Their Way into City Hall This Year“. Rumblecrash – “Pro-HALA machine funded by Facebook founder” and “Billionaires plan to strip homeowners of political power“. This entry was posted in Calls to Action, Land Use, Quality of Life, Schools, Transportation, University Relations, WallHALA on February 18, 2017 by Frank Fay.